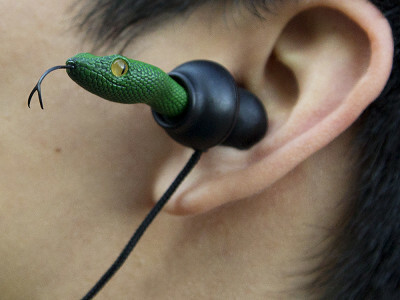 These earbuds are unlike anything you’ve ever seen. The Viper Heads come right out of your ears, and other styles, such as the Snake Eyes and Rusty Bolts, have an equally large impact with luminous eyes, realistic scaling and cool, gothic detailing. But the real proof for Quarkie earbuds is in the hearing: they deliver a fantastic listening experience, including noise isolation, low distortion and wide frequency sound. These earbuds are surprisingly lightweight, and each pair comes with four tailored ear pieces so they’ll fit anyone. They even have a built-in microphone for phone conversations. Great performance and memorable designs: as quirky as they look, Quarkie will become your favorite earbuds. These earbuds are unlike anything you’ve ever seen. 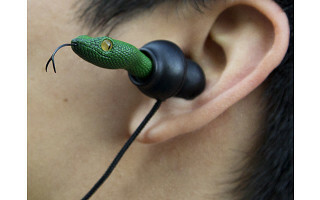 The Viper Heads come right out of your ears, and other styles, such as the Snake Eyes and Rusty Bolts, have an equally large impact with luminous eyes, realistic scaling and cool, gothic detailing. But the real proof for Quarkie earbuds is in the hearing: they deliver a fantastic listening experience, including noise isolation, low distortion and wide frequency sound. These earbuds are surprisingly lightweight, and each pair comes with four tailored ear pieces so they’ll fit anyone. They even have a built-in microphone for phone conversations.